Vitafood EU is an event dedicated to the functional food industry in Europe and is a place for meetings and business exchanges in the industry. Vitafoods EU is an event dedicated to functional foods, nutritious beverages, and supplementary foods in Europe, attracting over 10.500 visitors with an opportunity to explore the latest innovations, acquire knowledge and meet more than 600 new and existing suppliers. Vitafoods EU focuses on four key areas of the industry, meeting the business objectives from raw materials to retail products. Vitafoods EU is not just an exhibition. It helpsvisitors clearly understand the latest market trends, new products and innovations, as well as industry regulations. 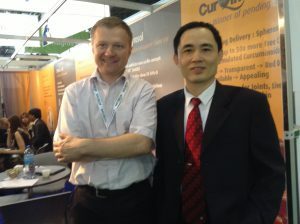 On May 14, 2013, Vitafoods EU exhibition was held in Geneva, Switzerland. A leading pharmaceutical company in Europe sent a special invitation to Dr. HoaAnh to visit the exhibition and sign a cooperation contract on distribution of Anabio products in Europe.